Gordon Connell - Call on Dolly! Gordon as Vandergelder taken by Charlie Karel. Gordon Connell (born March 19, 1923-June 12, 2016) is an American musical theatre and television actor. Born as William Gordon Connell in Berkeley, California, Gordon married Jane Sperry Bennett (aka Jane Connell), also a native of Berkeley. He and his wife began their career by performing at such San Francisco night clubs as The Purple Onion and The Hungry I. They eventually moved to New York City. In the late 1950s and early 1960s, he performed in revues at the Tamiment Playhouse in the Poconos and in several of the Julius Monk nightclub revues at Upstairs at the Downstairs, including Monk’s “Pieces of Eight” and “Dressed to the Nines”. He made his Broadway debut in Subways Are For Sleeping in 1961. 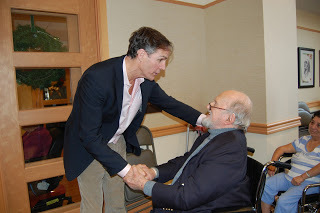 I visited him last week at The Actors Home in Englewood and spent the afternoon discussing all things Dolly! 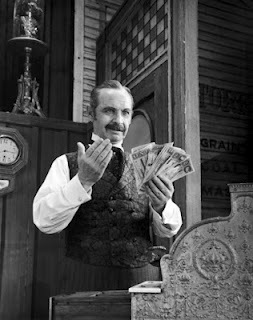 Gordon Connell played the Judge in the original production of Hello, Dolly!Early on in his career, after Hollywood, Gower Champion did a lot of revues. He was attuned to that type of performing. Gordon’s wife, Jane, and he and a group of graduates from the University of Southern California found a venue “like Judy and Mickey”. They did three separate reviews that summer of ’46. There were sketches and songs. They did their own costuming and everything. They were barely making a living but loving it. In 1948, Gower’s Lend An Ear opened at theLas Palmas Theatre, Los Angeles which featured an unknown Carol Channing. Then the Julius Monk revues came along that Gordon and Jane were also involved in. In a series of New York supper clubs and cabarets — the Ruban Bleu in the early 1940′s, the Downstairs, the Upstairs at the Downstairs and, in the late 1960′s, Plaza 9 at the Plaza Hotel — Mr. Monk was the host, or regisseur (meaning stage manager), a title he preferred. 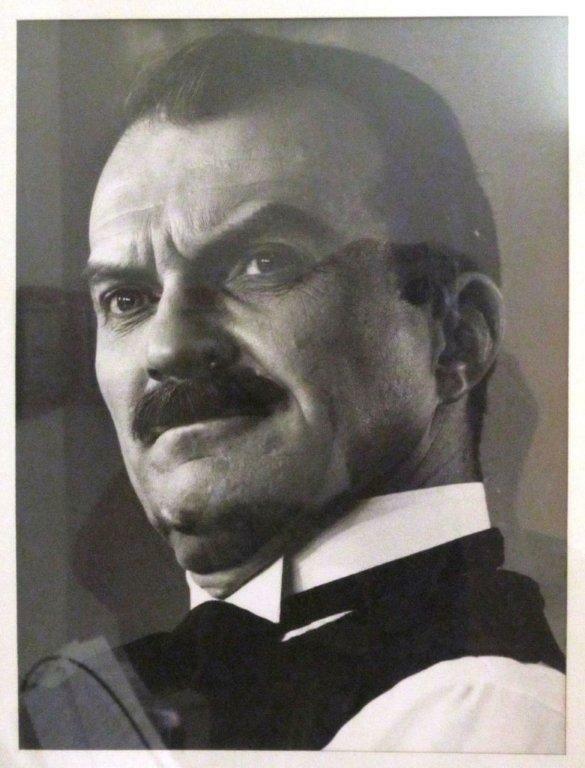 In the heyday of cabaret comedy, he was the most celebrated maestro. Julius would always greet Gordon with “Good morning, Eve!” Enough said. 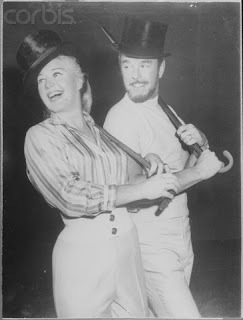 Gordon appeared with a troupe of actors that included Dody Goodman. In these reviews, Gordon would play the piano and the spinet with Billy Goldenberg. Among Goldenberg’s most noteworthy were his collaborations with Steven Spielberg on his telefilms (in particular, Duel) and his seven-episode contribution toward the NBC Mystery Movie detective series Columbo. He composed the theme music for several popular televisions shows including Kojak, Rhoda, Rage of Angels and Our House. He also composed the scores to countless of films and made-for-TV movies; including Onassis: The Richest Man in the World, 18 Again!, Guilty Conscience, Helter Skelter, The Legend of Lizzie Borden and hundreds others. Because of his involvement in reviews, Gordon was on Gower’s radar and he simply asked him if he would like to play the judge in Dolly, That Damned Exasperating Woman. Gordon said Gower was extraordinary when it came to casting. He had already cast David Burns as Vandergelder and was seeking an understudy for him. Gordon accepted the responsibility and was employed for the next four years. He only did it on Broadway. He did not do any of the tours. Gordon was one of the lucky ones. His role in the show remained intact as everyone else’s roles were constantly changing. He did not go on for Burns until 1966! He was on for 21 days. Burns called Gordon and asked him if he was up for the job. Gordon had been rehearsing with Gower’s assistant, Lucia Victor. 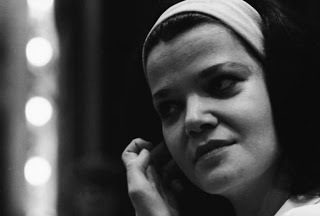 Gordon told me that Lucia’s passing was a distinct loss to the theater. He says he remembers making his first entrance on stage left with Alice Playton, Ermengarde. The memory is still vivid. He and Alice went on to do other projects together. He remembers one night after playing Vandergelder, that he forgot to come down to take his star bow until he was prodded to do so by a cast member…he was so used to taking the judge’s bow! Playing Vandergelder, he didn’t try to emulate David Burns. He also didn’t use this as an opportunity “to unravel his gifts as an actor.” He was just truthful to the text. It was a matter of finding the rhythm in the scenes. The punctuation. In the milliner shop, when Barnaby and Cornelius are hiding, there was a great thing that Burns used to do with his eyebrows while muttering under his breath. When Gordon stepped into the role, he tried to replicate that. The audience just thought it was “cute”. It didn’t work as well with him and he dropped it. It’s all about choices. Burns stayed with the show until 1966. That’s when Gordon first went on. Max Showalter replaced David Burns. Gordon said that Max brought more of a civility to the role. More of an upper class quality to the role, which came naturally to Max. Max and Betty Grable had a very good chemistry on stage. Gordon’s favorite Dolly was Martha Raye. 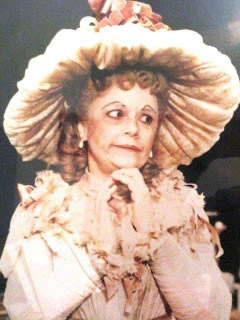 Her soliloquy to Ephraim, “Ephraim, let me go…” is one of the most moving I have heard of all the Dollys. When she came into the show, she had a very short rehearsal period, and did not want the critics to come to her opening night. Alan Eichler of Lee Solters’ office was there that night and felt that that was a mistake. He said it was an incredible night. Also, because of her “involvement” with the Vietnam War, there was also a lot of anti-war sentiment towards her. People stayed away. Martha was the one Dolly Jerry did not see. He refers to this in his memoirs, Showtune. He was in the hospital on her opening night. 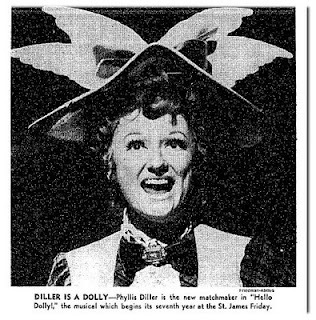 Phyllis Diller is an old friend of Gordon and Jane’s from their old Purple Onion days but he never saw her Dolly. As we all know, Carol was not the first choice for Dolly but she persisted until she got it. From time to time, Gordon would sit out front and watch the first act. He played opposite Ginger Rogers. Ginger, by the numbers, was a very disciplined performer. Her spontaneity was less than what Carol offered in the role. When Bibi Osterwald played the role, she brought a lot of her personality to the role, very motherly. Bibi was the standby for most of the Dollys. When she knew she wasn’t going on, she would go out and schmooze with the audience. Betty Grable had an efficiency in her performance and the other actors respected her. She knew where the “moments” were and made them work. After a while, Gordon grew weary playing the Judge night after night. He started doing capricious things on stage. One night, he would be Gabby Hayes. Then the next night, he might be Mae West. David Burns had a propensity for vulgarity, but always in good fun! In today’s world, he would not be able to get away with what he was getting away with 50 years ago. There was one instance in which a new “girl” joined the cast. His hands purposefully were full and he asked her to get a pen out of his pocket. “Would you reach in and get my pen?” That was a regular example of his “pranks”. I asked Gordon to describe the first time he heard the score. He said, “If there was a ceiling, he was there.” Charlie Karel told me hearing that score with the full orchestra in that rehearsal room was never replicated that way and it was magical. 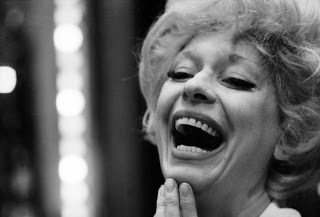 Jerry Herman was extraordinary. Interesting that Gordon appeared in one of Jerry’s most iconic shows as his wife Jane appeared in two others. 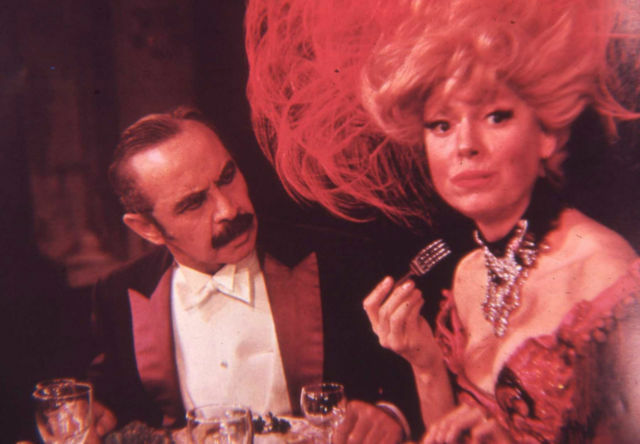 She, of course was Agnes Gooch in Mame. She was also in Dear World. Gordon said Mame was an example of Jerry’s versatility. It’s Today was revised from Show Tune which was in Parade. When Jerry was first interested in “musicalizing” Dolly!, Mister Merrick wanted an example of what he could create. He had a great ear for picking a style that was perfect for whatever he was writing music for. He was infallible in terms of the choices he made for his characters. Go back and listen to Gooch’s Song inMame. “Jane didn’t have to do much. It was just created for her.” He has an affinity for the full sound that a singer can create on a particular song. It’s obvious he really likes singers. He allows singers to “sweep with a sound.” It is never minimized by a lyric. Gordon wrote his own musical, Bertha, The Sewing Machine Girl. It was based on a 1906 melodrama. Bertha, the Sewing Machine Girl (1906), a melodrama by Theodore Kremer. [American Theatre, 9 perf.] Bertha Sloane (Edith Browning) and her blind sister Jessie (Leona Francis) come to New York, where Bertha hopes to claim their late father’s estate and also earn enough money in a sweatshop to help cure her sister’s blindness. Gordon was a schoolmate of Robert Emmett and they collaborated on this. Other than the Dollys that he appeared with on Broadway, he saw Pearl Bailey do Dolly. She was completely fulfilling according to Gordon. When I asked Gordon about his thoughts on the film. He doesn’t feel it’s as bad as people have desired to paint it over the years. Then there were the Barnabys! Glen Walken, Christopher Walken’s brother was originally cast as Barnaby Tucker. Edmund Gaynes told me that he, Christopher, and Glen auditioned at the Mark Hellinger Theater. They were all appearing in Best Foot Forward with Liza Minnelli at the time. Glen was in the beginning stages and was fired after two weeks in rehearsals.He was replaced with another guy, Gordon cannot remember his name. THEN, Jerry Dodge got the role and took it to Broadway. With Jerry, you instantly got the essence of Barnaby. Leading up to him, the others did not have that. Glen did not stay in the business. He became a merchant and is still living up in Vermont. I hope to interview him! When I asked him on any last thoughts on Dolly that he would like to share for my book. He feels that I’m taking on an enormous feat. “If you want to know why and how something works, look no further than Hello, Dolly!” He remembers opening night in a hotel suite on Fifth Avenue as the reviews were coming in and how happy he was for Gower. There were a lot of bumps to get to that point.